If I lived in a lemonade commercial this is how I’d be spending my summer. I haven’t sewn up and stuffed these last two embroidered dolls yet. I may have a little something up my sleeve for them. So cute! I love the croquet girl. Do you draw all these cuties yourself? I love her Hillary, my favorite yet. But, if you were to live in a lemonade commercial, wouldn’t you have to do all this embroidery sitting in an innertube in the middle of a lake. No…at home is much better. Your little embroidered girls are so cute. I can just see them framed in a little girl’s room. I think Toe Tapping Tilly is my favorite. Just love that little toe action. Maggie doesn’t know how lucky she’s going to be whenever she shows up. Oh, Hillary, she is my favorite of all. I love the colors, and her outfit, and her kerchief. Oh, she’s my favorite! How very sweet she is! Just wanted to let you know that I received my pattern booklet and postcards today. I love them, and so does my 6yo daughter! But the best part is, she’s planning to take a sewing class next summer, and doesn’t want ME to make one for her. She wants to wait and do it herself! That thrills me. So loveley. Those flip flops…! Your embroideries always have that special details. Nice! is it just a coincidence that she reminds me of amyk? love it! wonderful treat to the eyes. i too received my pattern booklet and look forward to trying my hand at it. you’re so inspirational. thanks for sharing your precious pieces. The lemonade thing is too funny. My grandfather once made a cassette tape of a country time lemonade commercial played on a continuous loop just because he liked the song in the background. I love this! Can’t wait to see what you do with them! I love these embroideries! They totally remind me of my childhood Betsy/Tacy fetish. Love ’em. 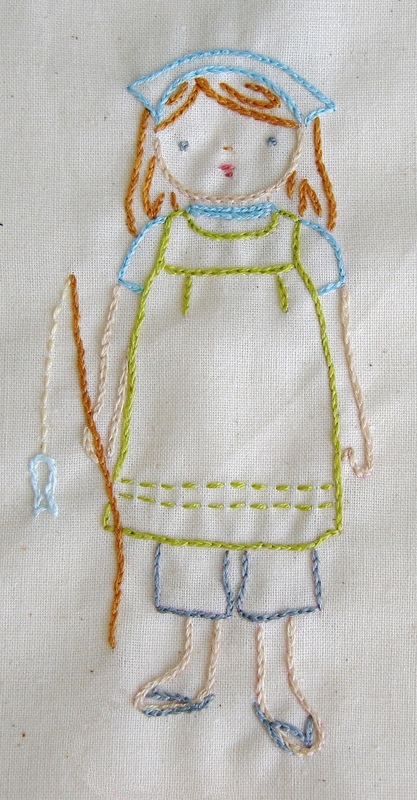 When is the booklet for embroidery girls coming out? You should seriously consider it! She’s super cute and just reeks (in a good way) of Summer Time! And I agree with Melissa about the girls being reminiscent of Betsy and Tacy- although with a modern/hip edge to them.Can’t wait to see more. So cute! I just finished my Fred Flare embroidery of a drumset for a gift. I used the split stitch and def. didn’t make it as teeny tiny and perfectly spaced as you did. But I think that stitch is pretty forgiving! you are amazing. how do find time to do all of this amazingly creative and beautiful work, have a family…. 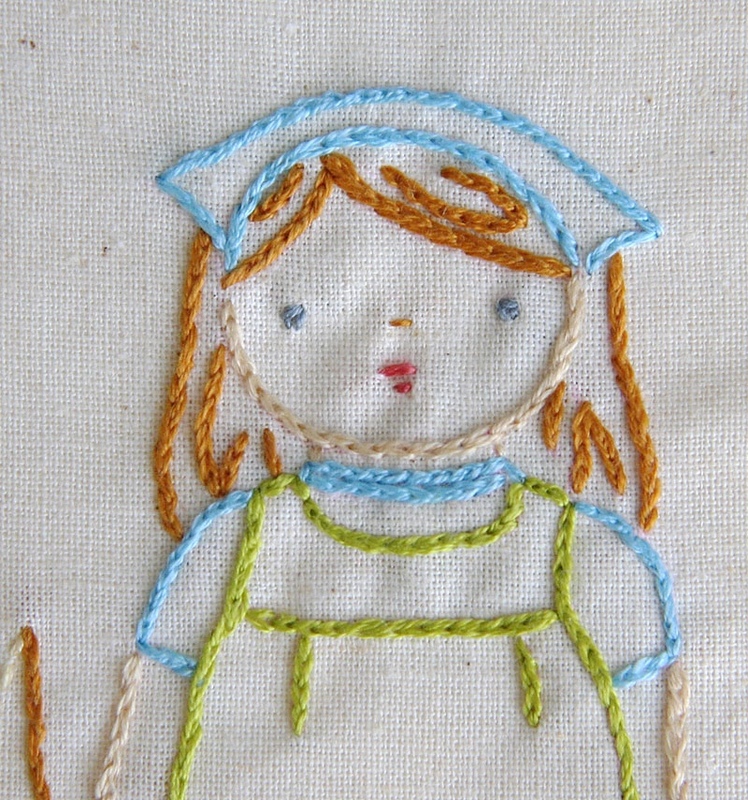 Your embroideries are amazing and your stitches are so even! You’ve inspired me to give it a try. She is gorgeous, all of them are. Can’t wait to see what you have up your sleeve, always a pleasant surprise. Your embroideries are great! I love them! She’s too cute! Beautiful, Hillary! I love the smock. Wow, how prtetty is that? Love the flip-flops!